Following the weekend’s games the Dons are now two points clear of the chasing pack of whom only fifth-placed Oldham have a better points difference. “A month ago we’d have been happy to finish in the top five and see where that would take us in the play-offs,” said head coach Richard Horne. “But we’ve finished the season really strongly and third place is a good position to be in at this stage of the season. “But we’ve still got Workington Town, who beat us easily at their place, and North Wales Crusaders to play. “The last time we played North Wales they ran us close at the Keepmoat. They are a big, physical outfit and if we gift them position through giving away penalties they’’ll cause us problems on Sunday at their place. The Dons equalled their biggest ever win (50-6) over Keighley and their biggest ever win at Cougar Park on Sunday. The sending-off of utility man Jordie Hedges, who is likely to miss the play-offs, took some of the gloss off the Dons’ win. “I don’t think the tackle was that bad or that it was intentional,” argued Horne. “I thought a yellow card would have been sufficient. “I thought that we dealt with playing with 12 men for over half the game really well. 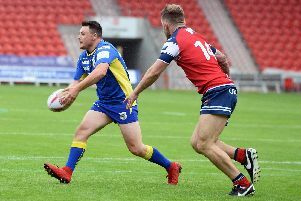 Winger Sam Doherty was another back to catch Horne’s eye even though his opposite number scored Keighley’s only try midway through the second half. “It would have been nice to have kept them scoreless but I thought that Sam had an outstanding game so you can’t be too critical of his part in their try – especially as he took a poke in the eye just before that,” said Horne.